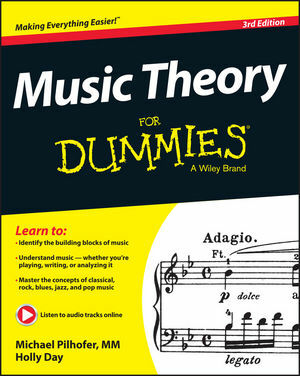 Whether you’re a student, a performer, or simply a fan, this book makes music theory easy, providing you with a friendly guide to the concepts, artistry, and technical mastery that underlie the production of great music. You’ll quickly become fluent in the fundamentals of knocking out beats, reading scores, and anticipating where a piece should go, giving you a deeper perspective on the works of others — and bringing an extra dimension to your own. Tracking to a typical college-level course, Music Theory For Dummies breaks difficult concepts down to manageable chunks and takes into account every aspect of musical production and appreciation — from the fundamentals of notes and scales to the complexities of expression and instrument tone color. It also examines the latest teaching techniques — all the more important as the study of music, now shown to provide cognitive and learning benefits for both children and adults, becomes more prevalent at all levels. Wherever you want to go musically — as a writer or performer, or just as someone who wants to enjoy music to its fullest — this approachable guide gives you everything you need to hear! Mike Pilhofer holds a Masters of Music in Music Education with a Jazz Emphasis from the Eastman School of Music and is an in-demand clinician. Holly Day's work has appeared in over 3,000 print and electronic publications internationally.